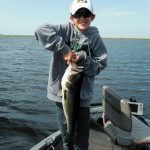 www.okeechobeejust4bass guided a fishing trip with the Krizan family on Oct 6 2014. It was a 6 hour trip using shiners. We had NE winds at 10-15mph and we caught 25 fish. The biggest was 6 lbs and Mr. C caught it. Here a picture of the biggest fish of his life.